I have written about this in the past and it seems to come up again and again. We all have our own ways that we have been trained to look at and deal with life. There is nothing we can do about it, for the most part. Actually, there is plenty that we can do about it, if we are committed to changing it. The barrier comes when we have to ask ourselves how much is it worth it to us? If you wanted to stop smoking and lose 50 pounds, how would that change your life? Would it change the way you showed up in the world? Would it change how people interacted with you? Would it change the way you felt? Yes, of course it would. The deal is though, once again, is how much do you want this change? It seems we are constantly plagued with the, "Is the grass greener on the other side?" Well, most times we do realize that wherever we go, there we are. However, we can change under the right circumstances and we do change as soon as the pain with the current situation becomes unbearable. Just like getting out of a hot room when you are sweating too much. As the saying goes, if you can't stand the heat, get out of the kitchen. But don't we also get used top the heat and just deal with it for quite a while in certain situations? Yes, we all have done this more than a few times. We hold out for many reasons on many levels. Our reasons are personal and most times cannot be properly rationalized. So when we expect something from another person on any level, what are we really saying? Are we saying that our way is better? Are we saying that doing it our way will make us feel better about ourselves? Maybe we are saying that if others do what we expect that there will be less conflict and that everything will just be absolutely smooth between us. The correct answer here is so completely different from person to person. We do expect things from each other and it's not always the best course of action. What would happen if you expected your newborn to walk perfectly within the first year of their life? If they did not achieve it, would you punish them and harp on it until they were successful? I would think not. By the same token, if someone is a habitual overachiever, should they be ridiculed for not needing the same amount of time to complete or master a certain skill. If you expect them to have a certain outcome, and then they don't, what is your next course action? I expect to succeed greatly. I expect to always remain curious. I expect to have a happy family of my own with at least two children. I expect people to do the right thing as much as possible. I expect to be met with opposition from time to time. I expect that marijuana will be legalized all over the United States. I expect that one day hate will dwindle down to a very minimum all over the world. I expect that when you show someone love and compassion that they will feel it and respond in kind. I expect to always be healthy in my body and soul. I expect to live for a very long time. Now if you read all of these again, which on of these are totally out of my control? Which one of these are not possible at all? Which one of these just sounds completely unrealistic? 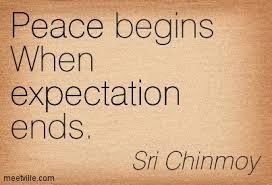 Yes, expectations can truly immobilize us in so many ways. Recently, I have been concentrating on what it is that I truly expect from myself and others. There is so much information in the answers to this question. Is what we expect of others depleting our souls? At times, I would agree so. However, to expect the best from yourself, is a solid choice that can actually inspire others to challenge the expectations that they have of others. To say it another way, if what you expect continues to let you down, then why are you continuing to go down that road? Some would say that some expectations are just futile because they stifle any forward motion. Others would say that their expectations are absolutely just and that they will not budge no matter what? So what are you expecting right now from others, and are you receiving it when you would like to? Sit with this for a moment. I am sending you a truck full of positive energy. Thank you for being here.